I received this book from Library Thing in exchange for my honest review. Audrey (Cow), by Canadian award-winning children’s author Dan Bar-El, is an entertaining children’s book that adults will want an excuse to read. The first things you will notice about this book is its size, hard cover, and great illustrations. It’s built like a novel with large print, the illustrations by Tatyana Mai-Wyss are delightful – in colour on the jacket, black and white throughout the book – and its first recommendation is by Doris the deer. Yes, a deer. Interested? It is an unusual approach and carries the story all the way through. It seems in real life there was a cow in Ohio that escaped the slaughterhouse in Ohio in 2002. Her experience inspired Dan Bar-El to write the story of Audrey (Cow). Audrey enjoyed her life on the farm with her mother and many animal friends. The one thing she dreaded was the big truck that would arrive every so often onto which would be loaded a few select cows. They would never return. Everyone knew what happened. Her own mother was taken that way. Audrey was determined to not end up the same way when she was grown and set about to devise a plan of escape, enlisting the help of her animal friends. 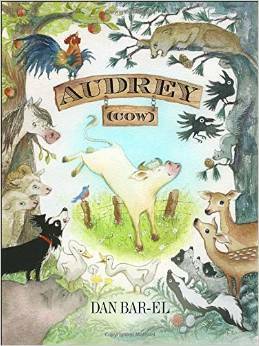 Audrey (Cow) is an amusing story told from the viewpoints of the animal characters through interviews. Each has its own individual personality, opinion, and contribution to the escapade. There even are humans unwittingly used to help. Audrey (Cow) reads like a mild thriller and is a great adventure story. It’s a safe read for children, holds one’s attention, and gives the reader a sense of satisfaction. 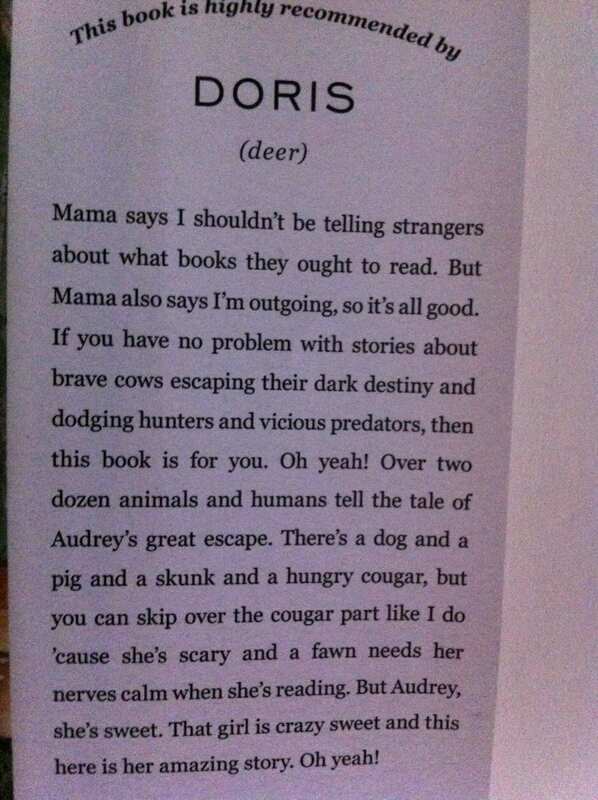 As I said, Audrey (Cow) is an entertaining children’s book that adults will want an excuse to read. No children to read it to? Never mind the excuse; read it anyway! You can find Audrey (Cow) on my BUY THE BOOK! page. This entry was posted in Mostly About Reading, Reviews & Interviews and tagged adventure story, animal escape, animals, Audrey (Cow), Canadian author, children's fiction, Dan Bar-El, farm life, storybook, Tatjana Mai-Wyss. Bookmark the permalink. This is a great book by a great writer. I took a writing with humour course with Dan Bar-El as the instructor which was excellent. His humour comes through in his children´s books. Everyone will be cheering for Audrey! How wonderful for you, Darlene, to have taken a course of Dan’s! This book is different from any I have read so far, and well worth the read. Tatyana’s illustrations capture well what is going on in the story.